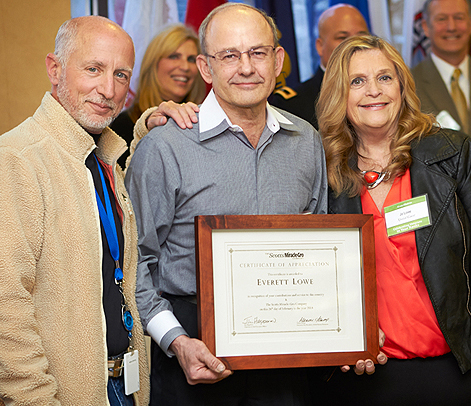 Everett Lowe (center), pictured with his wife Jo and Scotts CEO Jim Hagedorn, was recognized for his status as the Company’s longest-standing associate veteran, with nearly 45 years of service at Scotts. Everett is an electrician at the Marysville, Ohio plant. Today and every day, we honor our veterans at ScottsMiracle-Gro. Veterans working at the Company find that our CEO Jim Hagedorn, a United States Air Force veteran, has built a culture that is highly suitable to military experience. We are proud to support the armed forces in our hiring practices and our many philanthropic initiatives. For example, Everett Lowe began working at Scotts in 1968 shortly after graduating from Marysville High School, located a few miles from our world headquarters in Marysville, Ohio. Shortly after, he went on active duty with the Air Force, traveling throughout the U.S. and Guam before his service ended in 1972. When he returned, his job was waiting for him, and he has since become the longest-standing Scotts associate veteran. With 45 years under his belt at Scotts, Lowe works as an electrician in the Marysville plant. Associates have also volunteered with Homes For Our Troops (HFOT), a nonprofit organization that builds specially-adapted, mortgage-free homes for the most severely injured veterans from Iraq and Afghanistan. Most recently, 12 associates donated their time with HFOT to help landscape the home of Army Staff Sergeant Jason Gibson, who was severely injured by an improvised explosive device (IED) while serving in Afghanistan. HFOT has been working closely with SSG Gibson to build his family’s home in Marysville. Associates volunteered on a Saturday as part of the Company’s Give Back To Gro Associate Community Service Program and helped beautify the property around the home by removing trees, hauling away limbs, spreading topsoil and mulch, and planting new trees and plants.